I made no sales at the book fair but I made plenty of contacts and stirred up some interest. 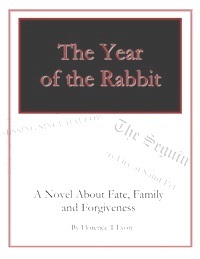 The reason for no immediate sales is that I didn’t have a printed copy of The Year of the Rabbit at the fair. That was my wicked plan. I was promoting the Ebook version of the novel with a take away sheet, luring puzzle lovers with a word search puzzle and a 50% coupon code for those who just may be interested in making an online purchase. Thanks for stopping by. Thanks for not waking the kitteh >^..^< Purr.